Click here to view this newsletter online, click here. Due to a year-long push by CP of NYS, our Affiliates and other nonprofit disability service providers, the 2017-2018 NYS Budget will include funds to begin to raise salaries for direct support professionals and other low-wage workers in our agencies. In a stunning day at the Capitol in Albany, Governor Andrew Cuomo said on March 28, that “this hand will not sign a budget that doesn’t include the $55 million for direct support professionals.” Governor Cuomo and the leaders of both Houses of the NYS Legislature promised a group of bFair2DirectCare supporters from across the state gathered outside his office in Albany that they all support the addition of funds to increase direct care salaries. Assembly Speaker Carl Heastie, Senate Independent Democratic Conference Leader Jeff Klein and members of the Senate Republican Conference including Senate Majority Leader John Flanagan were unified in their support and all commented on the effectiveness of the campaign and the support it had created. The Governor noted that this funding would come on top of the increase provided to bring workers up to the minimum wage, with a total 6.5% wage increase occurring over the next two years. The agreement ensures that the budget will include a 3.25% increase in salaries for 100 and 200 code employees effective January 1, 2018, with another increase of 3.25% for 100, 200, and 300 code employees effective April 1, 2018. The $45 million State investment announced by the Governor will also cover OMH and OASAS programs for the same group of employees. CP of NYS Affiliates stepped up advocacy efforts over the past 12 months, and it is those efforts, along with those of other disability providers, families, and staff, that made this campaign a success. Meryl Jackelow (right) and Maura Wachsberger, from Cerebral Palsy of Long Island in Nassau County, were among hundreds in attendance at the State Capitol on March 28th to hear Legislative Leaders and Governor Cuomo announce funding in the state budget to begin to provide a living wage to direct care workers at non-profit organizations providing support and services for people with disabilities. There is a great deal of news about legislative and policy issues at both the state and national level, and if you follow the current events, you know that things change daily or even hourly. That is why CP of NYS and our Affiliates have been active on several fronts. It should come as no surprise to anyone that the part of our organization that is most important to our success is our staff. Unfortunately not everyone in state government understands that, so we have been working very hard with Affiliates and others to obtain funding to be in a position to pay salaries that can be counted as a living wage. CP of NYS staff developed a proposal that the entire disability community has embraced – we put forth the proposal to encourage our elected officials to provide the funds we need to pay our staff appropriately. As most of you are aware, we are not able to increase salaries if the government does not increase our reimbursement. We are committed to working to obtain more State funding and we have two key advocacy activities that have provided progress and we believe will make a difference. This campaign began last spring as a collaboration between the Alliance of Long Island Agencies (ALIA), CP of NYS, the Developmental Disabilities Alliance of Western New York (DDAWNY), the Direct Support Professional Alliance of New York State (DSPANYS), the InterAgency Council of Developmental Disabilities Agencies (IAC), the NYS Association of Community Residential Agencies (NYSACRA), NYSARC Inc., the New York State Rehabilitation Association (NYSRA), and the Self-Advocacy Association of New York State (SANYS). The group made its case to state leaders in the past year and gained overwhelming support in the NYS Legislature. Both the Assembly and the NYS Senate have agreed to invest $45 million to begin to provide a living wage for direct care workers. The final piece needed to complete the puzzle was the support of Governor Andrew Cuomo. That support came on March 28th when the Governor pledged to include the funding in the NYS Budget. 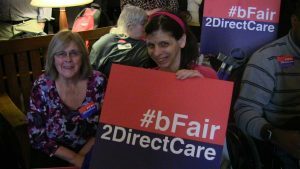 The #bFair2DirectCare campaign is asking Albany to invest $45 million a year for the next six years to fund a living wage for direct care workers, so our work is not done. Direct Support Professionals provide critical services to New Yorkers with disabilities. They deserve to make a living wage. It is time for New York State to step up and provide funds that protect direct care workers and the people they care for. Over the past 12 months this coalition has held rallies and news conferences across the state. One generous individual has twice donated an electronic billboard in Times Square to support the effort. The group has mobilized families, individuals with disabilities, staff and volunteers to advocate for this and other issues critical to the well-being of people with developmental disabilities. 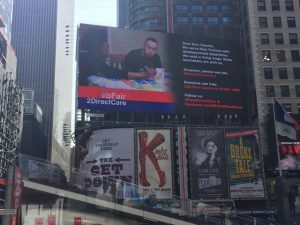 Dozens of newspaper stories and opinion pieces have been published in small towns and large cities all across the state and radio and television stations in Albany, New York City, Long Island, Binghamton, Buffalo and in-between have covered #bFair2DirectCare events. The message has been heard in Watertown, Ithaca, and Brooklyn, and the NYS Legislature has stepped up to support us. 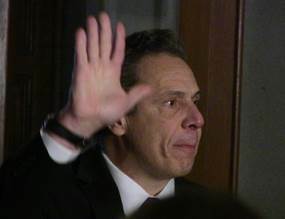 Now Governor Cuomo has agreed to include funding in this year’s budget. CP of NYS and COPA have joined with a number of other groups concerned about potential federal threats to Medicaid funding, specifically the threats to Medicaid in New York State. We signed onto the #BecauseOfMedicaid campaign which is intended to demonstrate the wide variety of New Yorkers who depend on Medicaid for healthcare and community supports. It has allowed us another avenue to voice our opposition to the American Health Care Act’s proposed cuts to Medicaid expansion and an end to the Federal government’s commitment to funding based on need. Alarmed by cuts to the Medicaid program contained in the American Health Care Act, a broad group of organizations from throughout New York State came together to create #BecauseOfMedicaid, a campaign to highlight the importance of Medicaid funding to ordinary New Yorkers and urge members of Congress to oppose the act. Through social media and other vehicles, the campaign tells the personal stories of New Yorkers who depend on Medicaid for crucial care and services. The campaign will continue until the proposed legislation is defeated. Our primary hashtag is #BecauseofMedicaid. You can also add #NYNeedsMedicaid for a state-specific one and #NoCapsNoCuts to respond specifically to the Trump Administration’s proposal. One sample Social Media post looks like the one below. You can direct these messages, as well as letters, emails and phone calls, to your elected representatives. Find contact information for all your elected officials at the national and state level by clicking here and entering your zip code in the designated box, then tell them not to cut Medicaid and why. The Coalition of Provider Associations (COPA) is hosting a Human Resources Professionals Conference for the Disability Provider Community on June 20th in Saratoga Springs. We are pleased to have assembled a program that will be of interest to Human Resources staff, Agency Executive Directors, Quality Assurance and Corporate Compliance administrators, and other management staff at disability provider organizations. Join human resource professionals from across New York State in this first of its kind event targeted for people working in the disability field. For the latest information about the conference, and to register for the event, please go HERE. We ask that you distribute the brochure to your staff and any other HR or local professional networks that you think might be interested in attending. Register and reserve your place today! Aaron Medeiros, the Director of Acquisitions and Policy at Time Equities, Inc., has been named to the CP of NYS Board of Directors. He has been with the New York-based national real estate investment company for more than a decade and is responsible for acquiring, underwriting, and financing assets nationwide. Mr. Madeiros leads a team that has sourced, financed and acquired $500 million in business deals across all asset types. He is also currently the project manager of a $120 million luxury condominium development in downtown Manhattan. He holds a Bachelor of Science Degree in Finance from Drexel University and currently lives in New York City with his wife and daughter. “Aaron Maderios will be a very valuable addition to our organization and we look forward to having him share his knowledge and experience with us,” said Susan Constantino, President & CEO of CP of NYS. The 2017 Spring Home Service/ NYS Elks meeting was held in Cooperstown April 20-21. Home Service Directors from across the state were joined by Jamie Peace and Jan Pashley from the NYS Elks Association and representatives from CP of NYS for presentations and discussions on topics critically important to families supported by CP of NYS and its Affiliates. Adam Stofsky of LawHub discussed the CP of NYS Statewide Family Advocacy Project and website supported by a NYS Legislative Grant. He talked about the reasons the project was begun, its goals, and accomplishments to date and showed clips of some of the videos already produced. You can view the site here http://www.nyfamilyrights.org/. Jamie Peace and Jan Pashley from the NYS Elks discussed the 53-year history of support by the Elks for the Home Service Program. They also discussed the Home Service Vehicle Grant Program and the special grant program that provides additional financial support to projects at several Affiliates each year. The deadline for submission of the special grant requests is May 1. The event also included a presentation of the first Lou Withiam Award to Cheryl Garlock from CP Rochester. 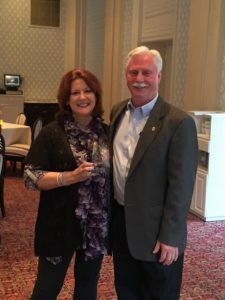 The award has been established to honor a Home Service Director who has exhibited exceptional dedication and commitment to supporting people with disabilities and their families. Mr. Withiam raised millions of dollars to support the Home Service Program during his two, 3-year terms as Chairman of the NYS Elks Major Projects Committee. He was a great friend to the organization and it was felt that this was a fitting way to recognize his commitment and to honor a Home Service Director each spring. Kate Marlay, Deputy Director at OPWDD, spent about two hours with the group on the second day discussing a wide range of topics, including Respite, Self-Direction and Conflict-Free Case Management. She offered a great deal of information and also responded to several questions from those in attendance. The next statewide meeting of the Home Service Directors will be conducted in October at the CP of NYS Annual Conference at the Hilton Hotel in Saratoga Springs. 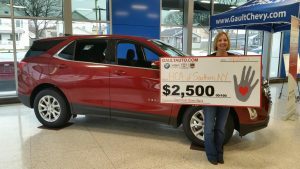 Gault Auto Mall in Endicott is awarding two local charities $2,500 each month for the entire year. CP of NYS Affiliate HCA of Southern NY and the Southern Tier Veterans Support Group were the March winners. The recipients are chosen through social media voting and each organization can win up to 2 times during the calendar year. HCA Executive Director Steve Sano sends his thanks to Affiliates who voted for HCA. Click here for more information about the contest. Maybe there is a business in your region that would like to conduct a similar campaign. The Kelly for Kids Foundation was established in 1987 by former Buffalo Bills quarterback Jim Kelly to support organizations that assist children in the Western New York region. Since its inception, the foundation has raised nearly $5 million. Through its Community Grants program, the foundation is inviting applications from health and social service organizations that serve the region’s disabled and/or economically disadvantaged youth. Grants will be awarded to support innovative programs that directly assist children in need and/or provide equipment and physical improvements for organizations dedicated to programs for disadvantaged children and teens. To be eligible, applicants must be a 501(c)(3) nonprofit organization based in and serving youth in Western New York State. See the Kelly for Kids Foundation website for complete program guidelines and application instructions. Completed applications must be postmarked by Monday, October 23, 2017. Through the annual program, grants of up to $2,500 will be awarded to support local nonprofit organizations within the service area of individual Walmart stores. Grants will be awarded in the areas of hunger relief and healthy eating, sustainability, women’s economic empowerment, and/or career opportunities. The Junior Tennis Foundation (JTF) was incorporated in 1979 as a non-profit organization to raise funds for junior tennis and adaptive tennis within the United State Tennis Association (USTA) Eastern Section. Over $2 million has been granted to worthy programs and scholarships to junior players since the inception of the Foundation. Grants can be used by recipients to initiate or expand their tennis activities. Grants may be used to start instructional programs and/or leagues for junior and adaptive players. The JTF Grant will be available to all not-for-profit organizations, with an emphasis on National Jr. Tennis and Learning Chapters (NJTL). Applications are due May 15. Grants are available on the USTA Eastern Grant Portal or on the USTA website. If you would like more information, please contact: Jenny Irwin, Tennis Service Representative, Northern Region, USTA Eastern, 70 West Red Oak Lane, White Plains, NY 10604, 518-369-6380 (T). Watch our website for more details – www.cpofnys.org!